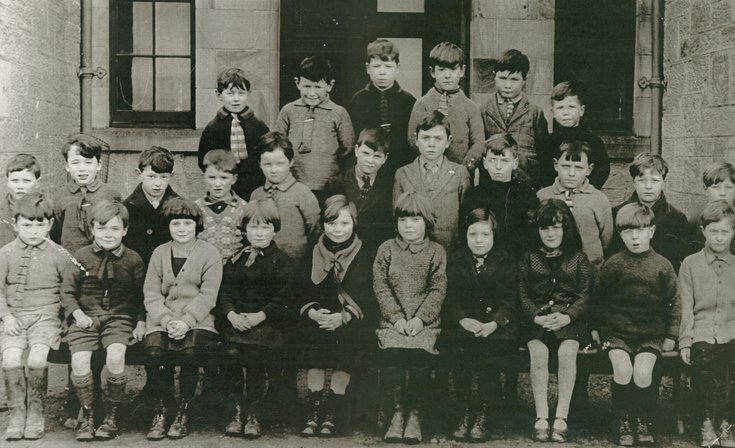 Group photograph of Dornoch Academy taken around 1928 with details, as far as known, of those shown. L- R Back Row: Willie Mackay; John Macgregor, Kenny Macrea, George Swanson, Harry Wright, George Calder Middle Row: ?........., George Matheson, Alastair Topp, Richard Grant, Ken Sutherland, Alex Mackay, Gideon Rutherford, Eddie Munro, Hugh Ross, Jimmy and Alex Manson Front Row: ?........, Duncan Mackenzie, Chrissie Munro, Cathie Murray, Nannie Punton, Joey Mackenzie, Molly Mackenzie, Lorna ?...., Nick Manson, Andrew Macleod. My Aunt Chrissie Munro of Roseville, North Street was born in 1921 so she would be seven in 1928. (See entry above). On No. 3963 Chrissie is younger and I have given details for these Munro sisters on No. 3963.